I loved my grandmother. She was the kind of grandmother that always made you feel very welcome at her house. She mixed 150g margarine and 150g sugar and whipped it until white. My grandmother was strict, but fair. She was the boss in the house. I felt safe around her. She mixed in 3 eggs, one at the time. Her kids, my family, are spread around the country, but at Christmas we would always gather at my grandparents house. Those always were very happy times. She mixed in, a bit at the time, 190g of flour, ½ a teaspoon of baking powder and ¾ dl of milk. There would always be wonderful food when we visited my grandmother. She put the mix in a buttered cake tin. Some of my fondest childhood memories are from eating at my grandmother's house. She peeled 2 green apples, and split them into wedges. She then put the wedges into the mix already in the tin. I loved the apple cake she made. I didn't really have apple cake anywhere else. Or maybe I just don't remember having it anywhere else? Nothing could compare to her apple cake. She sprinkled 3 tablespoons of brown sugar on top of the mix. There was something unique about the texture, the flavor, the mix of the sweetness of the dough and the acidity of the apples, in this cake. And it was so wonderfully fluffy. She baked it at 175 degrees C for 40 minutes. My grandmother died a few years ago. 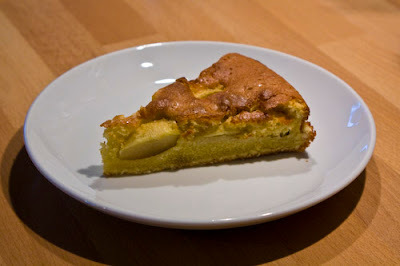 I will always miss, and cherish the memory of, the times I was able to eat her apple cake. She served me the cake as dessert tonight. I turned quiet when eating it. She looked at me, wondering what was wrong. My wife had baked apple cake with my grandmother's recipe, and it was exactly like I remembered my grandmother's apple cake. I got teary-eyed. I never thought I would taste grandmother's apple cake again. Now my wife had made it for me, and she hadn't even got to meet my grandmother. I hadn't been happier in a long time. I love you dear wife. tja, fær slenge me på grininga i au. OK, thats it!!! Next time you and Minnie are having dinner at our house, the dessert is on you guys!! !